Having written two splendid books on wine (The Judgment of Paris, To Cork Or Not To Cork), George M. Taber’s third book does not meet the high expectations set by the previous two. 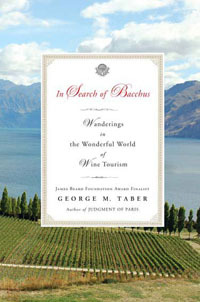 Trying to find Bacchus, the Roman god of wine, Taber travels the world of wine in an unpredictable fashion. The book begins with a description of the wine travels of three pioneers (John Locke, Thomas Jefferson, Robert Louis Stevenson) and follows with Taber travelling himself. While his choice of destinations is interesting (e.g. Georgia), the reader struggles to follow his reasoning (or lack of reasoning) for visiting certain regions and not others, creating the feeling that his search of Bacchus is somewhat incomplete. Wherever Taber goes, he finds some remarkable stories and people, but at the end of this wine book, the reader is completely overwhelmed by almost 300 pages of random details such as the genealogy of a hundred winemakers and Parker and Wine Spectator ratings for bottles sold out and drunk long ago. The hands-on suggestions for wine travelers are very few. The reader expecting addresses, opening hours, prices, etc. is severely disappointed. The reader who wants to wander off his daily routine for a few hours from the comfort of his armchair might find some value in this wine book.